When choosing a name badge or name plate, there are many factors that affect the way you present your business. From the shape and the font to the materials used, every detail comes together to create the final product. When it comes to choosing the right color for your custom-made name badge or nameplate, we have you covered with a wide range of engraving colors. Our selection of engraving colors allows you to create a custom product that truly reflects the atmosphere of your company or maybe the personality of the employee. With a wide range of engraving colors to choose from, you are sure to find the perfect option for your next name plate or name badges. With these engraving colors, you will be allowed to choose two colors with one being a standard color such as white, black, or gold, but the second color is more open to preference. We offer colors such as green, blue, navy blue, plum, teal, gray, yellow, and more. 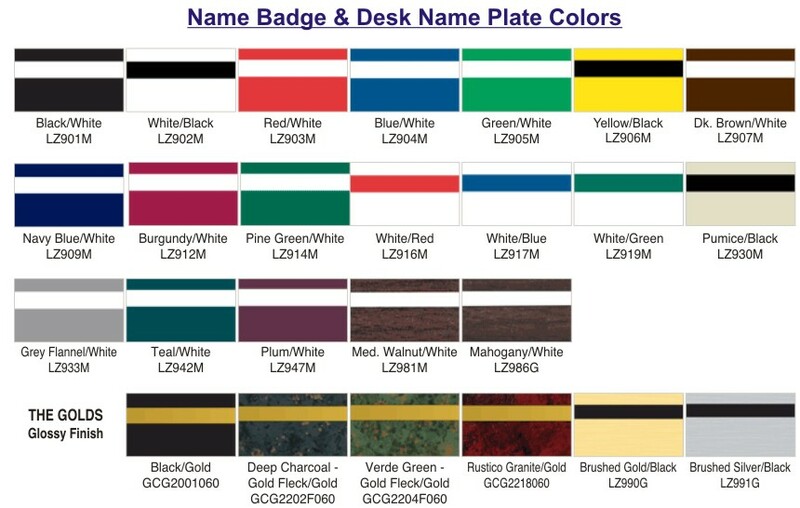 When looking for a sophisticated look with a professional edge, consider our collection of colors with wood grain or our gold flecked glossy finishes in deep reds and greens for an elevated look to any nameplate. We aim to offer you a wide selection of available color choices so you always have options perfect for you. Looking to create name badges that coordinate with the company logo colors? We have you covered with these options. Need a nameplate to match the professional style and decor of your location? Find it here with these color choices! No matter what color choices or combination you are looking to create, we can make it happen! At Rubber Stamp Champ, we are honored to be your choice for a wide range of products from great brands. We have spent the last two decades creating custom engraved stamps and more for our valued customers. If you have any questions or concerns, please contact us today!